Our Website is updating all the time. From Tournament schedule, Rule Changes, Team Points, National Standings and News. Check out the site! Thanks for Playing Missouri NSA. All bat companies listed below are approved bat companies for the 2018 season provided that the bat bears the NSA2012 logo (see below). An Approved Bat List is no longer provided – all approved bats must carry the NSA2012 logo. Please see the Non-Approved Bat List located on PlayNSA.com under the INFO tab / Equipment link for additional bats that are not legal for play with NSA. NOTE: Easton GHOST bats are NOT legal for NSA play!!!! Senior Bats do not have to bear the NSA2012 logo however, No Senior Bat will be approved for play unless the Senior Bat is manufactured from one of the bat companies listed as an approved NSA Bat Company. Rawlings Sporting Goods Company Inc. 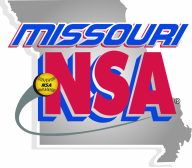 ENTRY FEES: Missouri NSA will reserve the right to collect tournament entry fee's from teams that back out of any tournament after the bracket has been generated. Failure to pay the tournament entry fee will result in suspension on the team and all players on the roster.